The IRS Interest Rate Increased to 6% On January 1, 2019! The IRS Interest Rate Stay at 6% On April 1, 2019! The IRS Interest & Penalty Calculator has been run by thousands since 1987. The easy to use program is regularly being updated to include new penalties, amended penalties, new interest rates and other features. This comprehensive program can be used for both income tax and payroll tax. Order Now! Special discounted price through 4/27/2019 $139. Regular Price $169. Order licenses for additional machines. Show how much you have reduced your client's penalties and interest on those penalties. Use the IRS Interest and Penalty Calculator to compute the worst case penalty scenario. If you are able to get your client off of penalties, show your client how bad the situation could have been. Prove to your client that your fee is a bargain! Save time with delinquent tax returns. Calculate the interest and penalties, if appropriate, that will be due with the delinquent tax returns. Have the taxpayer pays the interest that is owed along with the tax. This reduces the chance that the Internal Revenue Service will send another notice demanding money. This reduces a follow up call from your client, and saves you time. Reduce future shocks, if your client is being examined by the IRS. The interest and penalties that your client might owe might be significant. Letting your client know how much tax interest and penalties will be due with the unpaid tax could eliminate your client's shock after getting the tax bill. If your client will be upset at paying $20,000 in tax after an audit, your client will be livid when she learns through the mail that she also owes $5,000 in penalties and interest. To possibly reduce payroll tax penalties. The IRS Penalty Calculator feature can often reduce penalties by recommending the order that deposits should be applied to liabilities. Reduce IRS notices and client dissatisfaction with amended tax returns. Use this software to show your client how much interest and penalties he might owe. Help calculate tax interest computations for Certification by U.S. Person Residing in the United States for Streamlined Domestic Offshore Procedures (Form 14654) or Certification by U.S. Person Residing Outside of the United States for Streamlined Foreign Offshore Procedures (Form 14653) in conjunction with FBAR and FATCA. Reduce or eliminate tax penalties and interest in bankruptcies. The IRS has a problem with overcharging penalties in this situation. Show the Detailed Interest and Penalty report to the IRS. We have a bankruptcy attorney that is 100% successful in these situations. Correct erroneous IRS notices. When IRS employees get involved with the penalty and interest computation, there is a greater chance that the notice will be wrong than when the IRS computations are made without IRS employee intervention. Plan for deductible IRS interest paid by a business to the IRS. The IRS Interest Calculator feature can be used to determine how much tax interest a business owes. A cash basis business can pay that deductible tax interest in a tax year when the deduction is most needed. The program can be used to compute accrual basis tax interest, if appropriate. To determine how much to put into escrow to pay off a lien. This can be helpful, if the client is attempting to buy or sell real estate if an income tax lien is involved. To determine how much tax interest should be paid in excise tax situations. If you need to compute the interest on "push out elections" for partnership IRS audits, please call 1-800-326-6686. State interest support for AR, CA, FL, GA, ID, IL, KY, LA, MA, MD, MI, MN, MO, NY, PA, RI, SC, UT, VA, VT and WV. 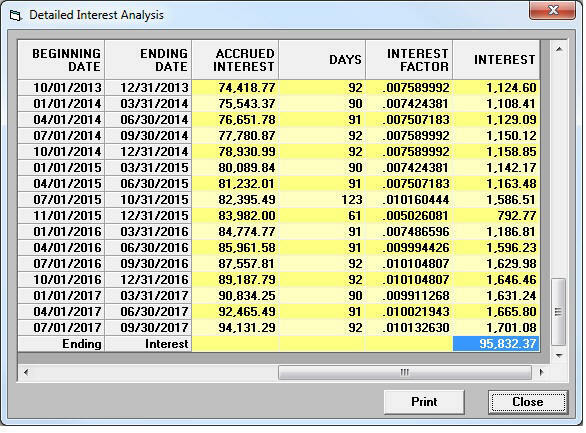 The program's reports can show detailed interest and penalty computations, including days between dates and interest-rate factors. Failure To File (§6651(a)(1)) and the .5% (§6651(a)(2)) and 1% failure to pay penalties can be computed. The software can accommodate an unlimited number of tax payments. The program can compute §6662 Accuracy Related Penalties including – Substantial Estate or Gift Tax Valuation Understatement, Negligence, Substantial Understatement, Substantial Valuation Misstatement, Substantial Overstatement of Pension Liabilities, and Economic Substance. Interest calculations as far back as 1954. Corporate 2% interest increase after 1990. More information is available about this program in its manual. An IRS Interest & Penalty Calculator is not required to compute tax interest, it is possible to compute interest by hand. In some situations IRS interest calculations are used to determine interest in non-tax judgments. If §6621 is used to determine the interest, you can use the IRS Interest and Penalty Calculator to make the computation. The penalty calculations strictly follow the Federal law. Thus, if the state penalty computation is *identical* to the Federal computation, you can use this program. If the state penalty computation is different, you can put it into the program as an Other Charge. This program currently supports interest rates for AR, CA, FL, GA, MA, MO, ID, KY, SC, LA, MD, MN, UT, VT, V, VA, IL, MI and PA. Sometimes the states drag their feet in releasing interest rates. It is not unusual for us to release the program before all states have announced the new interest rate. Harry Rabin, EA, Harry Rabin & Co, El Cerrito, CA. As of January 26, 2019 we started shipping the 2019, Quarter 2 version, WINT2019Q2.10. This version has verified IRS interest rates and IRS interest rate factors through June 30, 2019. The IRS Interest Rate Increased To 6% On January 1, 2019, and the rate is likely to increase to 7% within the next 3 - 6 months. (This is based on the current underpayment and overpayment interest rates and what the Federal Reserve Bank is predicting).